For the Surry Hills pub folks out there, you’ll be familiar with the names Dove & Olive (winner of Time Out’s Pub of the Year 2015) and Keg & Brew (highly commended for Time Out Pub Revival Award 2015 and nominated for Best Beer List 2016). Both of these pubs went through amazing transformations from shabby pasts into Sydney craft beer and pub grub hotspots. 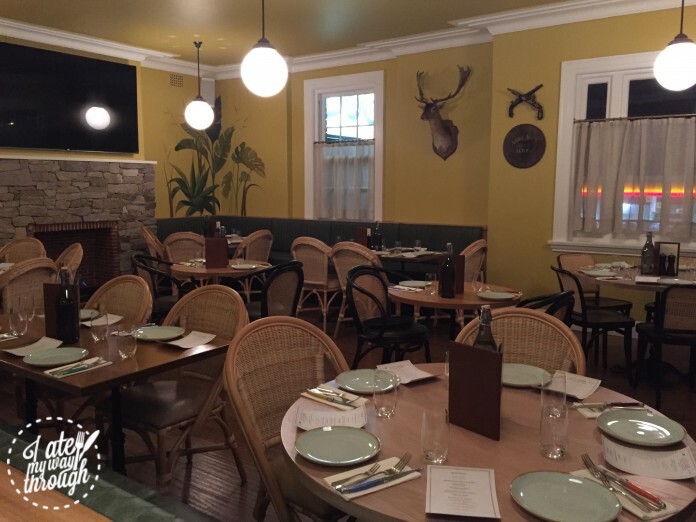 What you may not know, is that the guys at Good Beer Company are behind the success of these two Surry Hills institutions and now they’ve brought the winning formula to Randwick, launching their third pub revival project – Duke’s Bistro. Downstairs the pub retains its original form but as you climb the dark timber staircase guided by the dazzling chandelier, you enter a completely different space. The yellow and green theme colours flow through the entire dining room from jungle themed murals, to the furniture and tableware, creating a warm and welcoming ambience. The long rectangular dining room is subtly divided into three sections –- intimate round table seating to the left; a single elevated communal table spanning the centre alongside the open plan kitchen; and a casual seating area to the right. 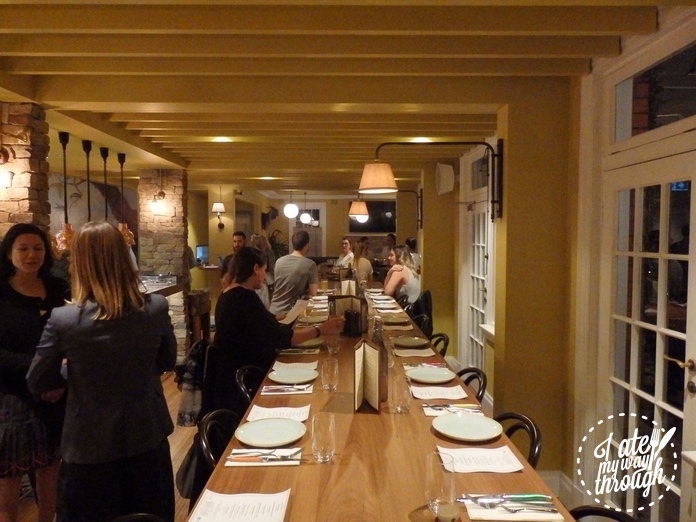 The menu is American-French and designed to share. Escargot Beurre Persille Vol Au Vent ($15) is well coordinated with restaurant theme colour by design or coincidence. 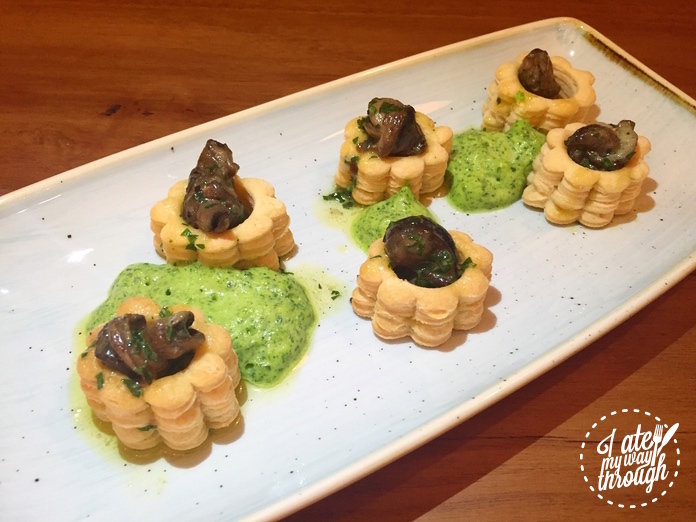 At first bite the crispy puff pastry of vol au vent changes into juicy tender snail covered in parsley butter sauce, it is a perfect light starter that sets the mood for the night and takes your imagination to the River Seine under the sparkly lighting of Eiffel Tower. Australian ocean king prawns ($6.50 each) are graded into 5 weight categories and U6 (under 6) is the highest weight range at 76gram and over. Duke’s Bistro makes sure their customers only get the largest prawns that meet U6 grade. 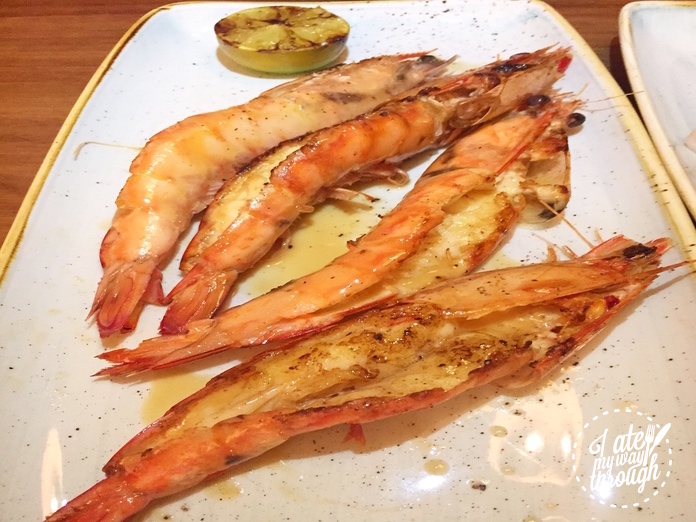 And what better way to enjoy fresh jumbo prawns than simple grilled and drizzled with lemon butter juice. The meat is exceptionally sweet and the citrus simply enhances it. The next course teleports us from Paris to Louisiana. 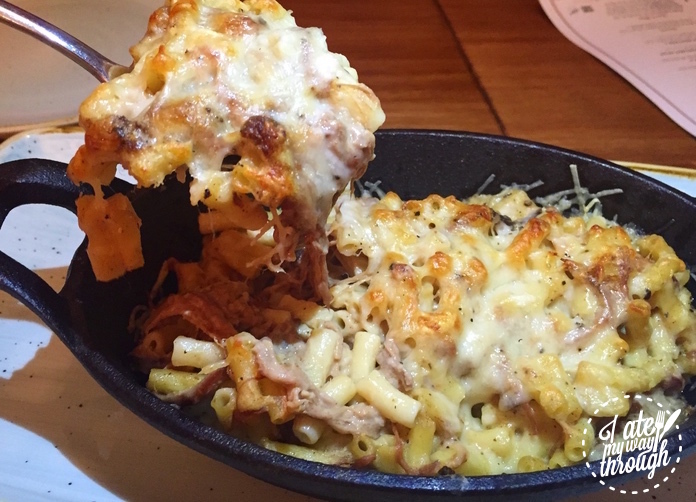 It’s creamy, it’s cheesy, it’s Beef Brisket Mac “n” Cheese Bake ($14). The smoked beef brisket not only adds extra texture to the dish but its smoky aroma teases the senses before I even take a bite. It is such a comforting and hearty dish that I nearly lick the plate to get every bit out of it. For the carnivorous there are plenty of meat dishes on the menu to choose from: The Beer Brined Chicken and Potatoes (half $22/whole $36) are roasting away in diners’ view in the open plan kitchen. The moisture is perfectly preserved during roasting process and meat falls apart at the merest touch of cutlery. The same can be said about the slow cooked Lamb Shoulder Snow Pea Tendrils Au Jus ($39), cooked to perfection and the meat can be cut through effortlessly. The wine list is extensive and ranges from Australian domestic labels to a mixture of French and American wine regions. The 2016 Tar & Roses Pinot Grigio has a slightly pink appearance yet has all the refreshing crispy characters you would expect from the grape; 2013 Elderton Estate Shiraz is smooth velvety and has good depth. A good wine list is nearly as important as a good menu and Duke’s Bistro ticks both boxes! 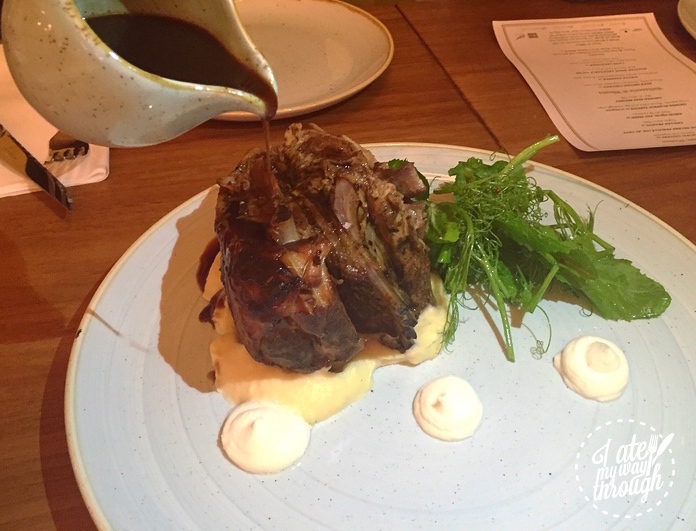 Satisfying is an understatement to describe the warm buzzing ambience, the attentive swift service, and most of all the outstanding execution of American and French classics with a modern twist. Good Beer Company has achieved great success with the Dove & Olive and Keg & Brew, and I won’t be surprised to see them emulate it at Duke’s Bistro. Previous articlePapi Chulo – Who’s your Papi?